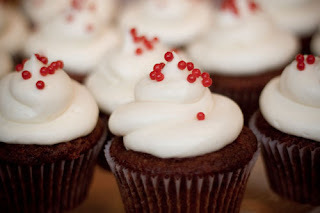 Red Velvet Cupcakes from Batter. I was in a panic to bring something sweet and delicious to my department holiday party- I didn't make my promised mint chocolate cupcakes the night before. A quick Yelp review brought me to a tiny kiosk on the corner that I've been meaning to jump off the trolley and take a look on my way to work. Picked up a dozen holiday cookies, so cute and such a hit at the party! Also grabbed a red velvet cupcake for a little treat. If you work in the FiDi and have a sweet tooth, stop by their little glass tube and grab a treat, it's delectable!